On October 14th at the press conference in the “Ukrinform” news agency, the Center for Social and Labor Research presented the latest results of the systematic monitoring of protests, repression and concessions in August-September 2014, dedicated to violence against civilians in the Donbass and to repressions against protests across Ukraine. The project is supported by the International Renaissance Foundation and the National Endowment for Democracy. Summary: After the shelling, the main threats for the civilians of Donbass were robbery, arrests and kidnapping. In spite of the armistice, the total amount of the cases of violence in September did not decrease comparedto August. Often, the victims were civilians as well as the representatives of private companies, local authorities, state-owned enterprises and educational institutions. At the same time, the relative level of violence across Ukraine during the protests and the actions of repression against protests was extremely high and even exceeded the level of violence and repressions during Maidan. Three quarters of all repression actions were reported in the Eastern and Southern regions of Ukraine; often it was against the demonstrations against the government or against support for the federalization/separation from Ukraine. Arrests, detentions, criminal and legal cases were the most common forms of repression during last months. Compared to the times of Yanukovych’s reign the law enforcement bodies were less engaged in physical confrontation with the protesters and intervened less frequently in the actions of protest, even though they did not stop the violence against the protesters by their opponents either. 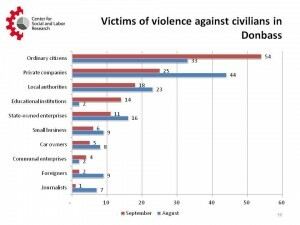 At least 335 cases of violence against civilians in the territory of Donetsk and Luhansk regions were reported in August and September 2014. In spite of the armistice, the number of cases of violence against civilians in September (161 cases) stayed practically the same as in August (174 cases). This figure does not include fighting between the Ukrainian armed forces and separatists, as well as civilian victims of the hostilities. It also does not take into account the violent actions against the law enforcement bodies and the Ukrainian army or the separatists’ irregulars. In general, the victims of violence (excluding the hostilities) were, in descending order: ordinary citizens (87 cases), private companies (69), local authorities (41), state-owned enterprises (27), educational institutions (15). Besides that, while the number of attacks on private and state-owned enterprises and local authorities has decreased, the number of attacks onordinary citizens and educational institutions has noticeably increased. 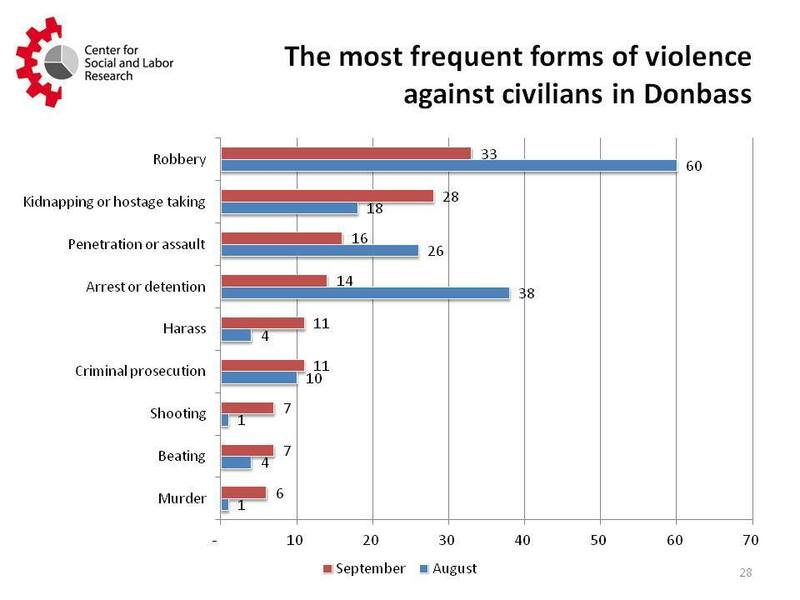 The most common form of violence against civilians in the Donbas, excluding fighting, in the past two months was robbery (at least 93 cases reported). Nevertheless, there were much fewer similar reported cases in September (33) than in August (60). A third of robbery cases were imputed to the separatists’ irregulars, and the rest to unknown armed people who could also be criminal gangs. In almost half of the cases (46) the victims were private companies and small businesses, as well as state-owned and utility enterprises, car owners, and pensioners. 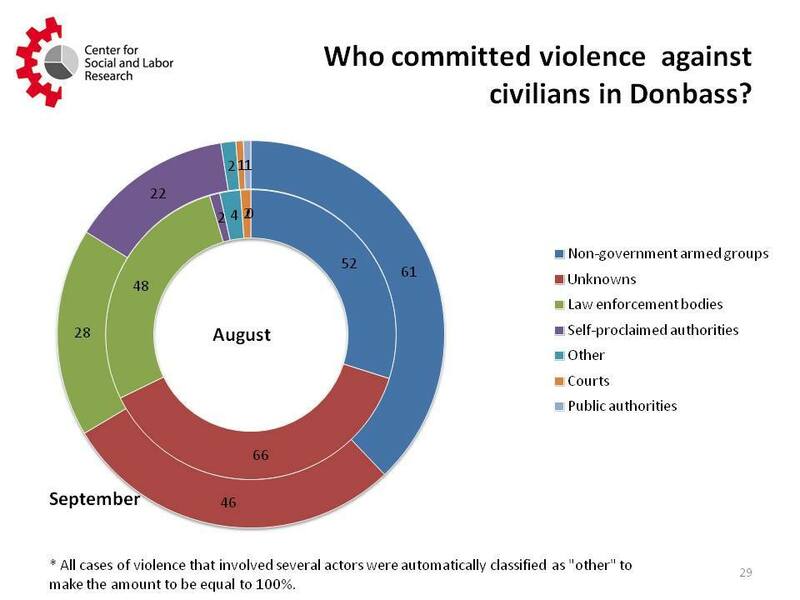 The second greatest danger for civilians of the Donbass were arrests or detention by Ukrainian law enforcement bodies (52 cases, although their number has considerably decreased since August to September from 38 to 14). The most typical charges were the support or the propaganda of terrorism and/or the violation of the territorial integrity of Ukraine, espionage for the benefit of separatists or Russia. At least 59 people were reportedly detained or arrested. In almost half cases (21) they were ordinary citizens, but also local authorities in the Donbas, members of the pro-Russian nationalist organizations, foreign citizens, journalists, businessmen, priests. The arrests and detentions were completed with criminal cases (at least in 21 cases). 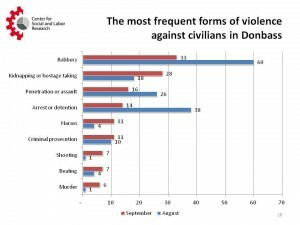 The third main danger to civilians in the Donbas was kidnapping or hostage taking (at least 46 incidents in the last two months). In addition, the number of such cases was much more frequent in September (28 against 18 in August). In most cases, it was reportedly done by militia and members of the self-proclaimed republics (29), in other cases it was reported to be unknown groups. Most kidnapping victims were ordinary citizens, but quite often local authorities in the Donbas, the heads of the universities (particularly in Luhansk), and some members of the self-proclaimed republics representatives or armed groups commanders because of internal conflicts between the separatists. In addition, attempts at intrusion, armed assault and capture of civilian areas remained quite frequent (at least 42 cases in the last two months), according to the reports, or by irregulars, or by unknowns. Most often attacked were private companies, but also state-owned enterprises, educational institutions, and private homes of citizens. In a few cases, Donbass citizens were victims of beatings (at least 11 incidents), opening fire on civilians and murder (reported in 15 cases and 12 were killed, almost all in September). The vast majority of these cases were attributed to the separatists, more rarely to unknown persons and in individual cases the members of Ukrainian volunteer battalions were suspected. Important Note: These data are inevitably incomplete and do not include incidents that were not reported on regional news. It is very likely that there were much more actions of violence against civilians in the Donbass, about which we were not informed. It is also important to keep in mind the situation of information warfare and the Ukrainian media’s tendency to ignore the violence of the Ukrainian forces and to exaggerate the violence from the other side. However, even these incomplete data make it possible to see the whole picture and relative share of all sorts of dangers to civilians of the Donbass. The rest of the territory of Ukraine also did not avoid violence and repressions. The relative level of violence at the protests and repressive reactions to protests values were even higher than during Maidan. In September, 18% of all protest events were violent (at Maidan – 13%), and 36% were confrontational (at Maidan – 23%). Moreover, compared to August, the number of incidents of vandalism decreased during the last month (36 to 26), but the number of cases of property damage increased (9 to 20), attacks without gunshot weapons (11 to 13), fights (6 to 10), shooting (5 to 8), murder (1 to 4) during the protests. However, an extremely high number of negative reactions to the protest as well as cases of repression of other social and political activism were reported. In particular, in September at least 241 negative reactions to protest were recorded, which makes 33 repressive reactions per 100 protest events. Simplifying, we can say that every third protest was repressed. To compare, during Maidan for every 100 protests there were 27 repressive reactions. The number of other social and political repressions (not related directly to protests) in September was at least 204 events. Instead, for all three months of Maidan the number of other repressions was only 251 events. Except for the Donbass, many repressions occurred in other Eastern and Southern regions, where the ratio of repressive events to 100 protests exceeded 40. Three-quarters of all repressive reactions to protests were recorded in Eastern and Southern Ukraine (including the Donbass). Much of the repression concerns opposition to the government and for the federalization / separation from Ukraine. In the past two months, arrests, detention, criminal charges and lawsuits were the most frequent forms of negative reactions to the protests across Ukraine, accounting for 70% of all repressive responses to the protest events. Again, the number of such cases exceeded the number of arrests, detentions, and criminal litigation during three months of Maidan. However, unlike the behavior of law enforcement during the reign of Yanukovych, they come relatively less into physical confrontations with protestors (32 cases in August and September compared with 110 cases in 2013 before Maidan and 199 events during Maidan) and attempt less frequently to prohibit or prevent the protests. Currently, law enforcement strategy is more preventive in nature and aims to dispose of dangerous protesters rather than suppressing protests. However, in many cases, the police did not stop the violence against protesters by their opponents, including non-state armed groups. The monitoring of protest, repression and concessions has been in process since October 2009. This is a unique project of systematic collection of information on all (regardless of issue and number) protests, repression and concessions in response to the protests taking place in real time on the territory of Ukraine based on monitoring of more than 190 national, regional and activist web media. The aim of this project, carried out by the Centre for Social and Labor Research in partnership with the Center for the Society Research, supported by the International Renaissance Foundation and the National Endowment for Democracy, is an objective study of protest activism and social movements in Ukraine and bringing this information to the attention of the general public in order to protect the right for peaceful assembly and to draw attention to grassroots social-economic protest initiatives. Center for Social and Labor Research was created in 2013 as an independent non-profit centre for the analysis of socioeconomic problems, collective protests, labor relations and conflicts.